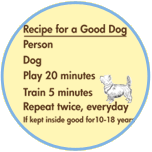 Since free dog training books seem to be "in" at the moment, I thought I'd write one. Pay attention to your dog. That means notice how it is acting and reacting. See what is there, not what you want to see. The time to stop your dog from doing the wrong thing is before that wrong thing happens. If you are paying attention to your dog you will know when your dog is thinking about doing the wrong thing. You are teaching a dog, not a furry human. Don't bother to yell. If you don't think your dog can hear you take your dog to the vet for a hearing test. Otherwise, speak clearly and distinctly, not loudly. Make the right easy, and the wrong difficult. Your dog needs lots of opportunity to practice good manners. That means living with you. Pay attention to your dog's needs. Your dog is a pack animal. That is important in understanding your dogs needs. Exercise together with your dog every day. That includes both mental and physical exercise. A minimum of 15 minutes walking away from the property, everyday. A minimum of 15 minutes of active play, everyday. It is another opportunity to learn cooperation with you. Your dog's most natural language is body language. To your dog everything relative to your body is important. The dog gets a different meaning when you stand up straight vs. when you bend over. It is different to face a dog head on than to face it sideways. It is different to talk standing up vs squatting down. Timing is critical. The closer in time between the dog's behavior and your reaction the more clearly the dog will understand the connection. It isn't that dog's can't remember, but they usually are not making the connection a human might. Training is teaching. Everything you do or don't do teaches your dog something. Make sure it is a lesson you want to teach. Make learning a part of daily life, not an exception out of the day. Be patient and consistent. Inconsistency leads to confusion and that is YOUR fault, not the dog's fault. Yes, the first and last lines are supposed to be the same. Without patience and consistency nothing else matters. Notice the timing issue? And the body language one? And consistency? Well those are the reasons it is so hard to teach yourself. It is very much easier to learn when you have someone who will bring your attention to things you do unconsciously. If you aren't aware you are doing it you need someone to notice and bring it to your attention. Taking a class provides controlled interactions, and a skilled observer who can help you learn more quickly with fewer bad habits. Instructors are forever despairing over their human students who don't notice when they don't follow through with a cue like "sit" or who don't notice their arms are telling the dog to do something different than the voice. The dog listens to body language first. People need help in being made aware of when they are sending their dog mixed signals. People need help to be made aware that the dog is reading something they have done differently, because they are a dog not a human.